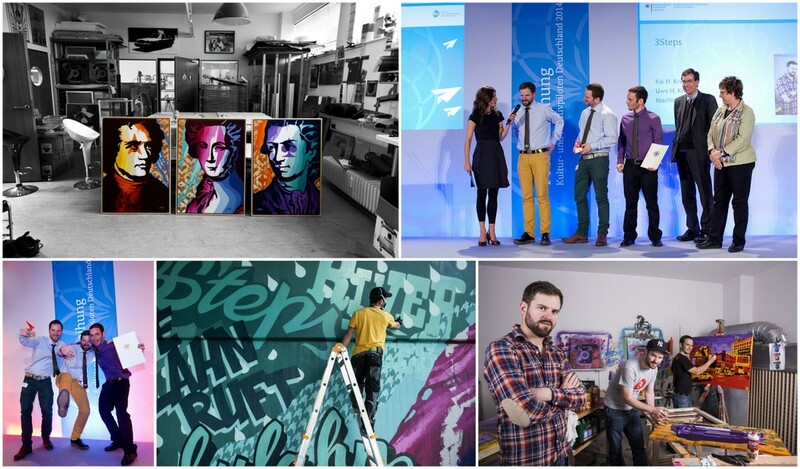 The Federal Government of Germany awarded the street art collective 3Steps from Hesse, central Germany “Kultur und Kreativpiloten Deutschland 2014” (Cultural and Creative Pilots Germany 2014). On the 5th of November 2014, the 32 award winners from the creative industry were entitled in Berlin. 869 creative companies competed for the awards of the German Ministry of Economy and Energy and the German Federal Government Commissioner for Culture and Media. The organization of the award is up to the u-institute and the Competence Centre Cultural and Creative Economy on federal level. Conveyor is the initiative Cultural and Creative Industries of the Federal Government of Germany. The Cultural and Creative Pilots Germany break new ground with their business ideas. They are founders, freelancers and self-employed persons who take imagination and entrepreneurship of their professional future into their own hands. The award is for ideas and people who give face and weight of cultural and creative economy through their actions. image sources: 3Steps & BMWi – Photo: Andreas Kermann.